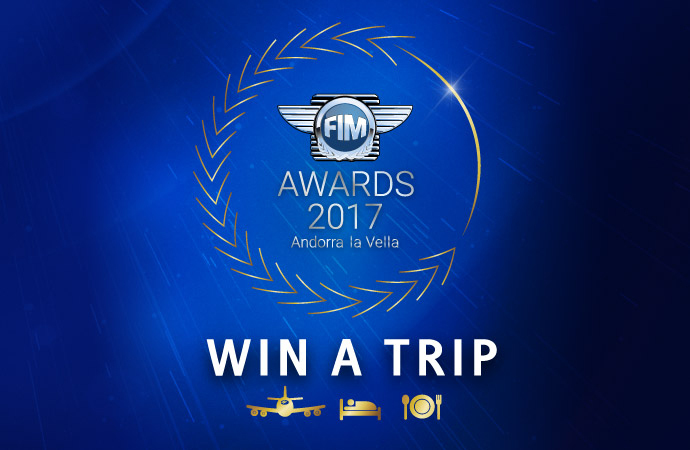 The 2017 FIM Awards crowned 35 World Champions in Andorra-la-Vella on 26 November. Our prestigious celebration of the sporting season was also the perfect stage on which to present the Fair Play Trophy and reward our Awardees in the FIM’s “Beyond Sport” categories: Women in Motorcycling, Road Safety and the Environment. We hope that these FIM Award winners will inspire future candidates and raise awareness of the FIM’s commitment to these important fields of endeavour. Sport is not just about winning – it is also about sportsmanship, respect, fairness and sharing. These values also extend to the FIM’s other key areas of interest, including Tourism. John and Beth Pineo, two Canadian motorcyclists, were involved in a terrible traffic accident after attending the FIM Mototour of Nations in Porto in 2016. Whilst in hospital, the couple were regularly visited by members of the Moto Clube do Porto, who brought them fruit, pastries and reading materials. They also took care of relaying the couples’ concerns to medical staff, in a country where not everybody is fluent in English, acting as liaison link with the hospital staff. This year’s Awardee has shown an outstanding sense of Fair Play by helping others in a distressing situation. Their acts of kindness to fellow-motorcyclists in distress are a clear demonstration of the values of sportsmanship. Increasing and promoting the presence of women in motorcycling is an important part of the FIM's vision. With this Award, through promotion, education and communication, the FIM and its Women in Motorcycling Commission (CFM) aim to encourage greater awareness of women active in all motorcycling–related activities. The Women’s Committee – Motorcycling Western Australia (MWA) was established in 2014 with the objective of promoting and building women’s/girls’ participation in motorcycle sport in Western Australia, as riders, volunteers, coaches and officials, advocating on behalf of women/girls with promoters/clubs/state for opportunity and recognition, and building social capital and support networks amongst participants to encourage longevity in the sport. The MWA has successfully worked to help women be increasingly valued and included in the motorcycling world, thereby improving women’s experience of motorcycling. Every year, millions of riders roam the roads worldwide. In order to help them to stay safe while enjoying the ride, the FIM Road Safety Award promotes initiatives or technology improving road traffic safety, particularly for powered two wheelers. Full Kontroll is a motorcycling rider training manual originally written for use in Norway. Subsequently the NMCU decided to produce an English edition and share it freely with the whole motorcycling world. Over the years it has been further developed and today is distributed as an e-book rather than in the original hard copy form. The project is developing further with a new series of videos. FIM experts consider this book to be one of the best training manuals ever written. It covers more than just machine control skills; the psychology of riding and driving is examined in detail so that riders can learn to be good partners in traffic with other road users. Motorcycling safety is one of the FIM’s strategic priorities, and 2017 Awardee NMCU’s Full Kontroll manual is a brilliant solution aimed at making the roads a little safer for motorcyclists. Environmental impact is one of the major issues we face when it comes to organising motorcycling events. Negative impact on the natural environment must be minimised whilst positive impact must be enhanced, making motorcycling an even more sustainable and green community. The FIM is committed to raising awareness and promoting green solutions throughout the entire motorcycling world. The German Motocross club MSC Grevenbroich has launched a vast awareness programme as well as working to protect biodiversity, especially certain endangered amphibian species on their site. Through educational measures and day-to-day action in the field, MSC Grevenbroich’s volunteers have managed to secure the population of amphibians as well as reinforcing the message that motorsport and the environment are not polar opposites. Their actions clearly reflect the FIM’s concern for protection and preservation of the environment, encouraging environmental management systems and “green” programmes. As the Sunday afternoon sun was going down over Andorra-la-Vella, the FIM Awards were only hours away. But the Champions were nowhere to be seen in their hotel; instead, all 35 FIM World Champions were meeting up with their fans at the Congress Centre next to the Christmas market for an all-time first Autograph Session that was open to the public. This year the FIM took on the challenge of giving the local people the unique opportunity of having an official programme signed by all the featured Champions at the Pre-Event. Over 1000 visitors, young and long-time fans, stood in line to receive an early Christmas gift, autographs and selfies that will be treasured souvenirs of the time they met all those special sportsmen and –women they had been cheering for all season. The Champions greeted their fans and were met with cries of joy, happy faces and even hugs that were later shared on social media by the delighted fans of motorcycling and its extraordinary sporting elite. The Champions all enjoyed the moment, sharing the passion with their fans. Whilst some were more used to signing autographs, others – especially in the youth and junior categories – discovered the precious moment of meeting people who could only dream of how it felt to race against other top-ranked riders in a thrilling world class motorcycling Championship. 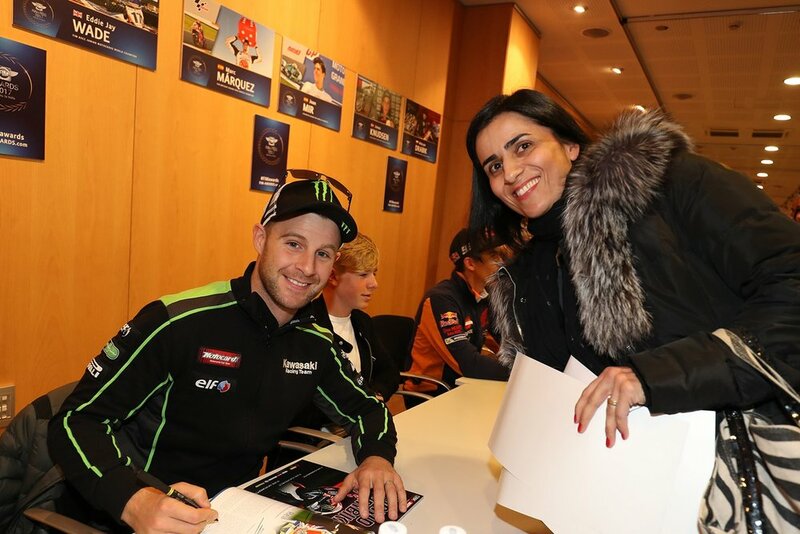 For two whole hours programmes, hats, photos and other personal items were handed out, receiving the long-awaited autograph, a lasting memory of a face-to-face encounter with the heroes and heroines of the motorcycling world. The annual season closing prize giving ceremony welcomed a new era as the first edition of the new FIM Awards was realised in the stunning ballroom of the Andorra Park Hotel in Andorra la Vella. Almost five hundred guests including 35 of the 2017 FIM World Champions gathered for a very special evening that was hosted by British broadcaster Gavin Emmett. Watch the FIM Awards video highlights! Gavin Emmett was joined on stage by a number of high profile celebrities from the mountainous principality and others as he wove a tale of recognition and reward for the many champions and award winners that was interspersed with some more light hearted and humorous moments. These included an impromptu guitar solo by 2017 FIM AMA Supercross World Champion Ryan Dungey. Following a new format the Next Generation category got proceedings underway proper after President of the FIM, Mr Vito Ippolito had officially opened the ceremony. Thirteen-year-old Eddie Wade who won the FIM 85cc Junior Motocross World Championship perfectly defined this catergory. In the aptly named Lumps, Bumps and Jumps category it was Andorra resident Toni Bou who was the stand out recipient as he collected an FIM X-Trial World Championship medal for an eleventh consecutive time. The Long Haul category was all about endurance and saw Chile’s Pablo Quintanilla pick up the FIM Cross-Country Rallies World Champion for a second year in a row. 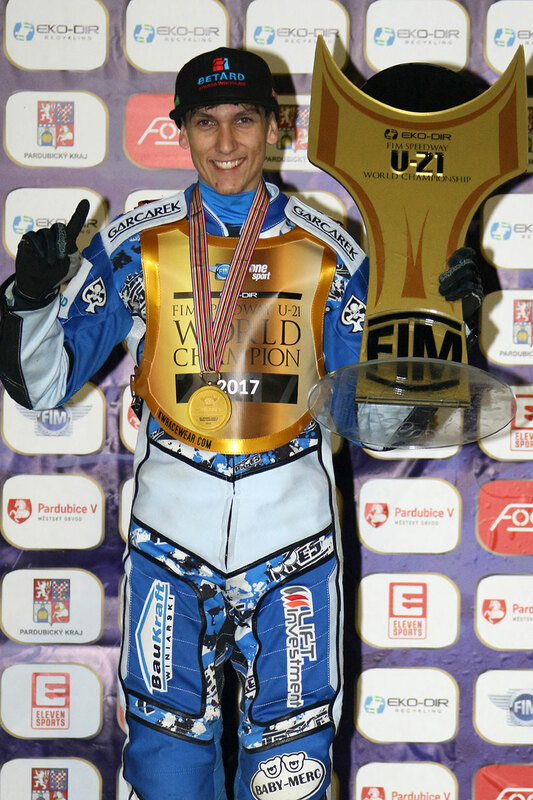 Russia was well represented in the Ice to Asphalt category with Dmitry Koltakov being declared the 2017 FIM Ice Speedway Gladiators World Champion. The Stepping Stones category included those champions who have made important strides in their sporting success, and this was illustrated by Josep Garcia who received his medal for becoming 2017 FIM Enduro2 World Champion. Finally it was the Elite category, which brought the highly applauded ceremony to a close. The female side of the sport featured strongly in this category with 2017 FIM Women’s TrialGP World Champion Emma Bristow and 2017 FIM Women’s Motocross World Champion, Kiara Fontanesi picking up their medals together with 2017 FIM MXGP Motocross World Champion, Antonio Cairoli, 2017 FIM Speedway Grand Prix World Champion, Jason Doyle, 2017 FIM Superbike World Champion, Jonathan Rea and 2017 FIM MotoGP World Champion, Marc Marquez. Alongside the champions, other successes were also recognised during the ceremony. Marc Marquez was very happy to present this Environment Award to the German Motorcycling Club, The MSC Grevenbroich. Whilst the FIM Road Safety Award went to The Norwegian Motorcycle Union for its ‘Full Kontroll’ initiative leaving The Motoclub do Porto to rightly pick up the FIM Fair Play Award for its kind actions. 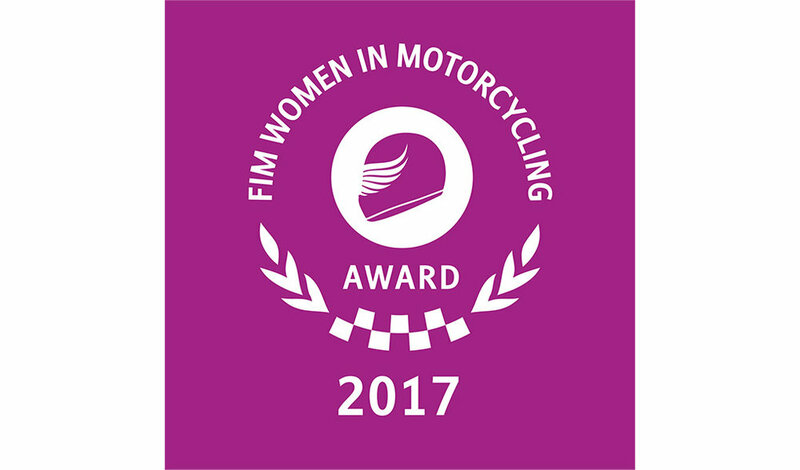 Finally the 2017 FIM Women in Motorcycling Award went to Motorcycling Western Australia’s Women’s Committee. 2017 winners of all the FIM Championship have been duly celebrated on Sunday night in a memorable ceremony held at Andorra Park Hotel, in the Pyrenean Principality. Over the past few days the town of Andorra-la-Vella has welcomed the influx of the 2017 FIM World Champions ready for today’s programme of events. The 35 champions and their chosen guests have arrived at the 5* Andorra Park Hotel - the venue that will host this evenings FIM Awards Ceremony. Ahead of the ceremony itself, the 2017 FIM World Champions will delight many fans with a very special autograph session in the Congress Centre at 15.00hrs(CET), before returning to the hotel to prepare for the black-tie event which will be streamed live on www.fim-awards.com at 22.00hrs(CET). A few of the two-wheel stars who have descended upon the town, already high in Christmas spirit, were happy to share what being here at the FIM Awards means to them. A well-known face within the two-wheel community, Gavin Emmett, our now regular master of ceremonies, has arrived in Andorra-La-Vella ready for the new-style FIM Awards that will which takes place this coming Sunday – 26 November. Currently a linchpin of both the presentation and commentary team for BT Sport’s live coverage of the MotoGP, having cut his teeth on other key roles within various global television broadcast outlets such as the BBC and Speed TV, Emmett can only be described as a true specialist within the industry. Emmett will being using the next 48 hours to finalise his script ahead of the grand reveal of the all new sparkling annual event. 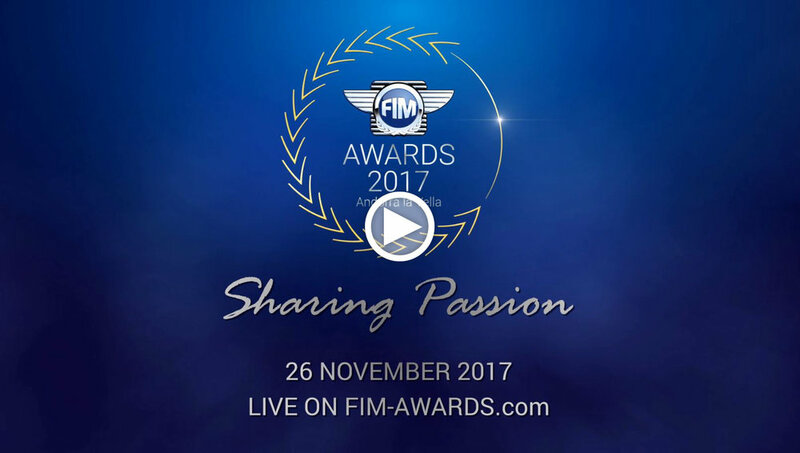 You can watch Gavin live on stage with all the 2017 FIM World Champions at this year’s FIM Awards Ceremony here at www.fim-awards.com 22.00hrs (CET) this Sunday evening. In Andorra-la-Vella, on 26 November 2017 at the FIM Awards, 36 champions and 4 awardees will be rewarded by the FIM for their World Championship title and remarkable work accomplished for the Motorcycling world. All have achieved incredible performances; all have reached for the stars and managed to touch them. In a room packed with the motorcycling community’s most distinguished guests, who better than legendary sportsmen and sportswomen, as well as members of the prestigious host-country political authorities, to honour our Champions with their medals? The FIM is grateful and proud to present its 9 FIM Awards 2017 Prize-Givers! Frenchman Luc Alphand initially started his sports career as a skier. Specialising in Super G and Downhill racing, he achieved a one-of-a-kind historical performance in 1997 by winning the World Cup overall title, only competing in the two speed disciplines (both of which he won). The triple Downhill World Champion then switched to car racing, taking part in numerous 24 Heures du Mans races and Dakar rallies. He finished 3rd in 2006 at Le Mans, finishing second in the Dakar twice (2005, 2007) and claiming 1st place in 2006. The Spaniard is an exceptional man in a number of ways. By winning the 1999 125cc World Championship he established a world premiere, ending his season with the title but no race victories. He is also an exception when it comes to a rider’s life after racing. Currently CEO of the Monlau Repsol Technical School (a reference in training drivers, mechanics and specialised engineers in the world of automobile and motorcycle competition), he is also Marc Márquez’s mentor amongst many other riders, always by his protégé’s side, the one who led Márquez to where he is now. The second Frenchman amongst our Prize-Givers, Cyril Despres is a Moto and Auto Rally driver with multiple Dakar wins to his credit. The 5-time motorcycle winner switched to auto rallying in 2015 and finished 3rd in this year’s edition. Cyril Despres’ relationship with Andorra is strong, as the French rider organised the Andorra 500 Rally, a 500km ride in a unique environment created by a man of passion for the passionate, in 2015 and 2016. After a 4-year term as General Councillor, Vice Chair of the Legislative Committee for the Economy, member of the Legislative Committee for Education, Culture and Youth and member of the Parliamentary Permanent Committee, the Hon. Mrs Olga Gelabert is currently Minister of Culture, Youth and Sports of Andorra. Multiple record-holder and 6-time World Champion Marc Márquez will attend this year’s ceremony for two important reasons. Not only is he the 2017 FIM MotoGP World Champion, but he is also an FIM Environmental Ambassador. Mayor of the Andorran host-city Andorra-la-Vella, Mrs Conxita Marsol has been working closely with the FIM management and staff to make the FIM Awards happen. Mrs Marsol and her City Council have been of great help to the FIM in the run-up to the Awards ceremony. Starting as an 85cc karting championship competitor, this Finnish sportswoman made her two-wheel debut in 1988. The first and only woman so far to have led a Grand Prix (in Hockenheim) and nicknamed “First Lady of Fast”, she rewrote history by being the first female point-scoring rider in the FIM 125cc World Championship. Unfortunately, a motorcycle accident ended her promising career. Today, she is a role model for women in the motorcycling world. Former road racing cyclist Joaquim Rodríguez has won multiple podium placings, in the Giro d’Italia, the Vuelta a España and the Tour de France. The Spaniard was an archetypical climber, achieving some spectacular victories such as the Tour de France mountain stage at Plateau de Breille. After a 16 year career as a professional cyclist and one of Spain’s most famous riders, Joaquim Rodríguez is now a team ambassador for Bahrain-Merida. Retired 11-time SBK race winner Rubén Xaus became the first Spaniard to win a FIM Superbike World Championship race in 2001. Competing in the Superbike categories most of his career, he moved to MotoGP during 2004 and 2005, scoring regularly and winning the 2004 “Rookie of the Year” title. Nick-named “Spiderman” for the way he hung his tall frame over his bike, he eventually returned to Superbike in 2006. Rubén Xaus can still be seen on the circuits nowadays, in particular as a SBK adviser. In a vast majority of two-wheeler motorsports, championship wins are achieved solo, aside from the Nations, Teams and ISDE. But a few specific championships stand out by virtue of the direct relation between several riders and one motorcycle. In such a situation, winning is no longer just a personal matter; instead, riders depend on their partners and their performances. They are not masters of their own destinies. The 2016-2017 FIM Endurance World Champions David Checa and Niccolò Canepa won 3 of 5 out of the season’s races, along with latecomer team-mate Mike di Meglio. Victory in this category goes beyond winning the race. For three different riders to be able to mount one single motorcycle, the settings must be universal and inclusive for all sizes and driving styles. A compromise has to be found, as there is very little time when riders come in to change places at the stand in just a few seconds. Furthermore, if the rider on the circuit ends up off-track, not only does he disqualify himself but he also penalises his fellow team-mates, helpless in the stands. Disappointment and anger are shared in an Endurance event but so are joy and triumph. The long hours on the track put the riders’ bodies to the test. They can make them ache and hurt, but in the end they tie bonds between the riders even tighter. Whilst Endurance is all about three riders alternating on one motorcycle, Sidecar and Sidecar Motocross put both rider and passenger on the same bike all along. It all comes down to team-work: a passenger cannot win without a rider (obviously) but a rider cannot win a race without his passenger on board. Curbs are very complicated to negotiate with a sidecar. In order to pull off such technical manoeuvres, passengers have to put all their weight on either side of the machine, holding on by just a thread, playing with the boundaries of what is possible. This year’s FIM Sidecar Motocross World Champions are rider Etienne Bax and passenger Nicolas Musset. With a superb start to the season and a fantastic end of season comeback, the Franco-Dutch pair won their first FIM World Championship together as well as their last, the physical distance separating the two men’s home bases being sadly too great an obstacle. Distance is less of a problem for FIM Sidecar World Champions, Birchall brothers Ben and Tom. Because trust and a perfect feeling for the partner’s movements are crucial during the race, the family link is definitely a big plus for both siblings. Mastering all their races except the final gold race, the Birchalls showed a perfect symbiosis throughout the entire season, combining their talents to form an ideal duo and allowing them to oust 2016 champions Pekka Paivarinta and Kirsi Kainulainen. After this second World Title since 2009, rider Ben and passenger Tom will surely defend their title once again with the same vigour shared this season. 2017 FIM Awards Teaser is here! Get a glimpse of our upcoming 2017 FIM Awards! A night of surprises, a night of glamour, a night of Champions! Sport is not just about winning – it is also about sportsmanship, respect, fairness and sharing. Fair Play, being a good winner as well as a good loser, is an essential part of all sports. But sometimes, winning or losing matters less than these core values sport teaches us. Let us not forget that sport may be a competition but it is first and foremost an activity to be enjoyed for its own sake. Candidates must show outstanding conduct and a remarkable sense of respect, placing safety and camaraderie first. The FIM Fair Play Trophy is not necessarily awarded each year, and that gives it a special meaning to those who have the honour of receiving it. As part of the elite of motorsport, riders have a social responsibility and therefore must inspire fans with the sense of Fair Play that they demonstrate. This year’s candidates have both shown their sense of Fair Play by helping others in a distressing situation. Their commitment to such an act of Fair Play is admirable proof of support, kindness and solidarity. They are true role models for the motorcycling community. John and Beth Pineo, two Canadian motorcyclists, were involved in a terrible traffic accident after attending the FIM Mototour of Nations in Porto in 2016. Whilst in hospital, the couple were regularly visited by members of the Moto Clube do Porto, who brought them fruit, pastries and reading materials. They also took care of relaying the couples’ concerns to medical staff, in a country where not everybody is fluent in English, acting as liaison link with the hospital staff. During the 2016 ISDE in Spain, Jens stopped during the race to help an injured rider. Regardless of his own time loss, he brought the rider out of harm’s way and gave him first aid. No one had stopped or reported the accident previously, and the German rider acted carefully and selflessly, making the injured rider his priority. As the ABBA song goes, we are still striving for the sky, but for this year all 2017 FIM Awards Champions are now standing calmly, their titles well and truly won! After this weekend’s action, newly titled Maikel Melero (FIM FreeStyle World Champion) and Marc Márquez (FIM MotoGP World Champion) both complete the list; the FIM will proudly reward 36 World Champions, 12 teams and 4 awardees at the 2017 FIM Awards Ceremony in Andorra-la-Vella. Some highly prestigious guests will be among us and celebrating our Champions in the Andorran capital. Well-known faces will be there for the umpteenth time like Toni Bou (22 times FIM Trial and X-Trial World Champion), Emma Bristow (4 times FIM Women’s Trial World Champion), Jonathan Rea (hat-tricking FIM Superbike World Champion) and Marc Marquez (4 times MotoGP World Champion) as well as “newbies” Eddie Jay-Wade (FIM 85cc Junior Motocross World Champion), Franco Morbidelli (FIM Moto2 World Champion) and Frenchman Mathieu Tresarrieu (FIM Long Track World Champion). Also a regular at the FIM Awards, Ryan Dungey (AMA Supercross FIM World Champion) will sign off after a superb hat-trick of FIM World Titles (4th title overall), leaving the spotlight at the height of his glory. This year’s edition will be marked by a newly conceptualised ceremony, with Stage Director Rodolph Nasillski bringing a fresh and creative impulse to the FIM’s traditional sports and entertainment bill. And because, with (almost) nothing left untried, the show must now go on, who better than World-class sports broadcaster and experienced Brit Gavin Emmett to bring it all to life and officiate as FIM Awards host. Before the curtain goes up on the ceremony at 10pm, riders will please their fans with an autograph session in Andorra-la-Vella congress centre in the afternoon before donning their suits and bowties and their gala dresses. Although the FIM Awards Ceremony is an invitation-only event, the FIM is eager to share this magical moment with the entire community by offering a LIVE-streaming feed during this glamourous night on www.fim-awards.com and through multiple live stories on social media. So, now that all is said and done, don’t miss a single news-feed and stay tuned on Facebook, Instagram and Twitter to get the latest updates! Environmental impact is one of the major issues when it comes to organising motorcycling events. The FIM has taken in consideration this impact and committed to raising awareness and promoting green solutions throughout the entire motorcycling community. In 1994, the first FIM Environmental Code was adopted, containing regulations and recommendations to improve the relationship between motorcycling and the environment and promote sustainable events. Many factors have to be taken into consideration such as gas emissions, sound levels, waste management and social impact. The FIM International Sustainability Commission (CID) is committed to caring for the environment and this Award is a unique opportunity to promote innovative and environmentally friendly solutions. Nominees for this award may be individuals, groups or organisations (FMNs, Clubs, Organisers Circuit Owners, Manufacturers, teams etc.) who have significantly enhanced environmental awareness and promoted eco-friendly behaviours. Their actions reflect the FIM’s concern for protection and preservation of the environment, encouraging alternative energy, environmental management systems and green programmes. Negative impact on the natural environment must be minimised whilst positive impact must enhanced, making motorcycling an even more sustainable and green community. While organising several Trial, Enduro and Supermoto championships, the FMA has developed many green initiatives. Under the banner of the KiSS – Keep it Shiny and Sustainable – project, the Andorran Motorcycling Federation has promoted green attitude and awareness, enhancing visibility in all its events. This circuit focused on respecting, caring for and integrating the environment during the FIM 2016 ISDE. Following the KiSS project, KiSS Navarra established a vast range of measures to ensure respect for the environment. By means of electric staff vehicles or reconditioning of unused roads, for example, the ISDE in Navarra made a contribution to sustainable sport. The German Motocross club has launched a vast awareness programme as well as working to protect certain endangered amphibian species on their site. Through educational measures and acting on a continual basis, MSC Grevenbroich’s volunteers have managed to secure the population of amphibians on their site as well as showing that motorsport and the environment are not polar opposites. Certified as a one of the most environmentally sustainable circuits, Mugello has a vast KiSS-related green programme. Its two main fields of action are separate waste collection and the fight against food waste. By installing recycling areas throughout the circuit and distributing recycling-kits to spectators, Italian circuit has demonstrated high-level of achievement. “Education” is the key-word for PZM’s Environmental Panel. With a wide range of educational actions such as games, lectures and awareness-raising activities, they provide eco-friendly tips and information to youth and fans and promote their actions through social media. SVEMO’s main project is “Promotion of biodiversity and motorcycling”. Vast areas of land are left undisturbed and as a result some species are disappearing, favouring a very restricted biodiversity. By maintaining “continuous disturbance” and moto tracks, this project helps meadows and other diverse habitats to flourish, thereby safeguarding biodiversity through motorcycling. Hundreds of riders have been proclaimed Champions; hundreds had to start somewhere, someday, young and unexperienced. Agostini, Doohan, Rainey, and more recently Rossi and Marquez; all started at the bottom and gradually made their way to the top. With today’s competitions being so hard to crack, new riders may not always have opportunities to pierce the veil and show to the Motorcycling community their talent. These youngsters just need the opportunity and space to do just that – like Jonas Knudsen (FIM Speedway Youth 250cc) and Marc Garcia (FIM Supersport 300), both crowned as the first ever FIM World Champions in their respective categories. Every year, the FIM rewards youth and junior categories in order to ensure a regular renewal of the two-wheeler elite. This year the FIM Awards will honour 8 Champions and 2 teams, some of them born after the year 2000! Being a Youth or Junior rider does not mean things are simpler on the motorbike, far from it. In what is described by some as the toughest Enduro Championship, FIM Youth Enduro World Champion Bradley Freeman had to fight until the last race to secure the title. Regardless of age, riders can achieve brilliant records, like Andrea Verona with his 9 consecutive wins or Facchetti and his astonishing comeback after his pelvis injury. Facchetti’s feat is all the more surprising when you realise he is only 17! Other riders are even younger, like Dennis Foggia or Jonas Knudsen, both 16 years old, but this year’s youngest FIM Awardee is Eddie Jay Wade (FIM 85cc Junior Motocross), aged only 15 – talk about youth! As if being born in the years 2000 and competing like a pro wasn’t pressure enough, some riders have a big legacy to live up to. Knudsen became FIM Speedway Youth 250cc Champion nearly 32 years after his coach Erik Gundersen was proclaimed FIM Speedway World Champion (the 1st of 3 World Titles). No doubt, when the master teaches the pupil, expectations are in order when it comes to winning the title. 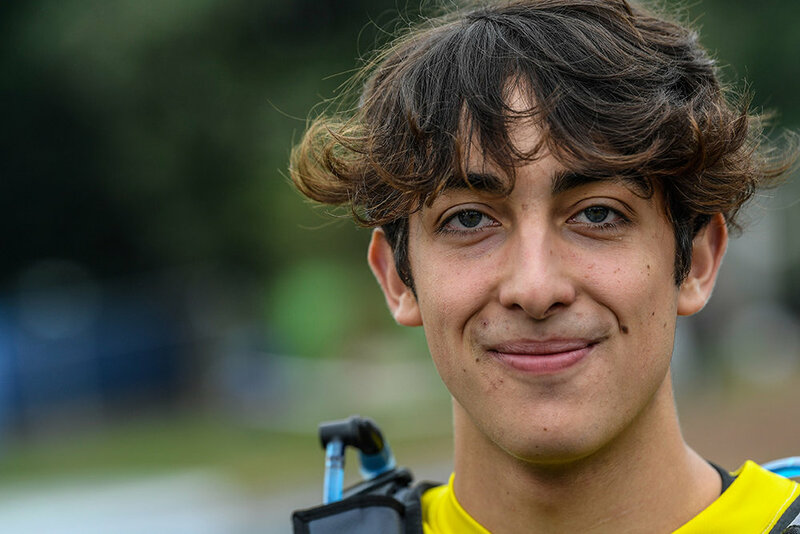 Foggia also has a special entourage; being the protégé of no other than 9 times FIM World Champion Valentino Rossi, the Junior Team VR46 Academy rider has some big shoes to fill, but his appetite for victory is not anywhere close to stopping short of his goal. As for Maksym Drabik, maybe talent is a family gene after all. Son of former Polish Champion Slawomir Drabik, he has talent running in his veins, like father like son. Safer riding, safer conditions, safer roads. Every year, millions of riders roam the roads world-wide. In order to help them to stay safe while enjoying the ride, the FIM Road Safety Award promotes initiatives or technology improving road traffic safety, particularly for powered two wheelers. The award may be conferred on an individual, a club, a national federation a governmental organisation, a non-governmental organisation, or a commercial entity. Through this award, the FIM wishes to encourage new solutions to diminish accidents, especially fatal injuries, making motorcycling an even safer passion. The award can concern different aspects of safety such as improved gear, emergency procedures, devices or infrastructure. It also rewards actions that raise awareness of the existing risks and the precautions motorcyclists should take. Such actions can vary from safety guides to awareness campaigns or prevention stands. Instructors and learning material are valuable assets to the motorcycling community, relaying the latest safety measures to ensure minimum risk and maximum pleasure. Road safety is also a major preoccupation in research and in policies. Improving material and innovating new alert systems is as fundamental as lobbying for appropriate road safety laws and advocating for safe riding conditions. Motorcycling safety is an essential part of the FIM’s values and this award is here to try to make sure that every day the roads become a little safer for motorcyclists. The campaign aims to raise road safety awareness amongst motorcyclists and reduce accident rates. It innovates by speaking to riders in an inclusive way, through advertising and at events. Results show that the 2014-2017 campaign has succeeded in overcoming the defensive attitude towards accident prevention campaigns adopted by many motorcyclists up to now. This lab is dedicated to road safety for riders and handles numerous projects geared to rider safety, safer infrastructure, and safer motorcycles. This French company is a leading innovator in the use of mobile phone technology to improve rider safety. Their Liberty Rider app places an automated call to emergency services in the event of a traffic accident. The MSF is a not-for-profit organisation and the main rider training provider in the USA. Through an innovative E-learning platform, it has reached out to 145,000 riders in 53 countries across the world to teach learner motorcyclists about safer riding. NASA has been nominated for its innovative work in road safety in the form of a national campaign addressing all aspects of safer riding. It has also carried out advocacy work linked to the UN Decade of Action for Road Safety. NMCU has developed the highly regarded rider training manual “Full Kontroll” and shared an English language edition with the whole motorcycling world free of charge. The latest addition is a set of videos to accompany the text. Nominated for his dedication to improving road safety in Jordan and the wider Arab world, Mr Zarour has also devoted much of his free time over a period of two years to preparing an Arabic edition of the Norwegian rider training manual “Full Kontroll”. The FIM Road Safety Awards winner is chosen by a panel of independent experts with an international reputation. *Recused himself in 2017, MSF being a candidate. It is part of the FIM's vision to increase and promote the presence of women in motorcycling. With this Award, through promotion, education and communication, the FIM and its Women in Motorcycling Commission (CFM) aim to encourage greater awareness of women active in all motorcycling–related activities. This award aims to recognise, reward and celebrate those, individuals or organisations, who have significantly contributed to improve the presence of women at all levels. In line with CFM’s “talent to come first” approach, the award-winners share common values and a commitment to increasing the standard of female motorcycling and the number of participants, as well as the representation of women in leading positions throughout motorcycling federations. Candidates for the Award seek to help women to be increasingly valued and included in the motorcycling world, by cooperating and creating opportunities such as women-only competitions and “have-a-go” events and by promoting role models. They develop sport and activities for women, thereby opening the motorcycling world to all. Women’s Motocross Rider – 5 times WMX World Champion. Landspeed and Circuit Racing – A mentor involved in motivational speaking and working with charities. She works with many organizations promoting motorcycle awareness, especially women and motorcycling. As an ambassador to women and riding, she aims at breaking barriers and inspiring women and kids. Aims to create and organise the first ever female only track day in Dubai with the objective to encourage female riders to ride on track and have a safe and fun experience. A not-for-profit association based in Geneva that organizes a large annual event to draw attention to and defend Women’s Rights by using motorcycles as an example of emancipation, independence, freedom and dignity. Their motto is “Ride/Drive our lives”. The commission has five main objectives: 1) represent the interest of female riders and encourage more participation; 2) raise awareness among female riders; 3) encourage more female riders to join the competition; 4) organize events to promote women’s participation; 5) organize specific female only events. The objectives are: 1) to promote motorcycling among women and increase women’s presence both in touring & leisure as well as in competition; 2) encourage industry (manufacturers etc.) to provide better products and services to female riders; 3) create a network and community as well as organizing events, trainings etc. The main goal is to encourage and support women to participate in FIM standard Enduro and Off-road competition, to offer to newcomers a welcoming and helpful environment, with guidance on the rules and help on the sections, empowering them and making them feel confident to participate in competitions. The team’s objective is to be a “role model” and attract more female riders to Endurance. The results achieved by this female only Endurance Team show that it is possible for female riders to take part in this very demanding competition and discipline. It sets an example for other female riders who are looking to take part in competition. The MWA Women’s committee was established in 2014 with the objective to promote and build women’s/girls participation in motorcycle sport in Western Australia, as riders, volunteers, coaches and officials , to advocate on behalf of women/girls with promoters/clubs/state for opportunity and recognition, and to build social capital and support networks amongst participants to encourage longevity in the sport. Although Andorra might look smaller than its neighbours, the reputation it has built up in motorcycling events these last years is, on the contrary, quite impressive. Perched in the middle of the Pyrenees, Andorra-la-Vella stands proudly between France and Spain and is Europe’s highest capital city at a little over 1000 metres. This year, it is hosting its first ever FIM Awards, but the motorcycle vibes are strong in Andorra-la-Vella, venue for a vast number of FIM Trial World Championship rounds and other motorcycling events. This riders’ paradise is also home to numerous champions like Toni Bou. The 22 times World Champion is not Andorra’s only motorcycle celebrity. French 5-time Dakar Champion Cyril Despres has lived in the country for the last 16 years. Although he chose to switch to cars in 2014, the Frenchman never gave up on his childhood passion. 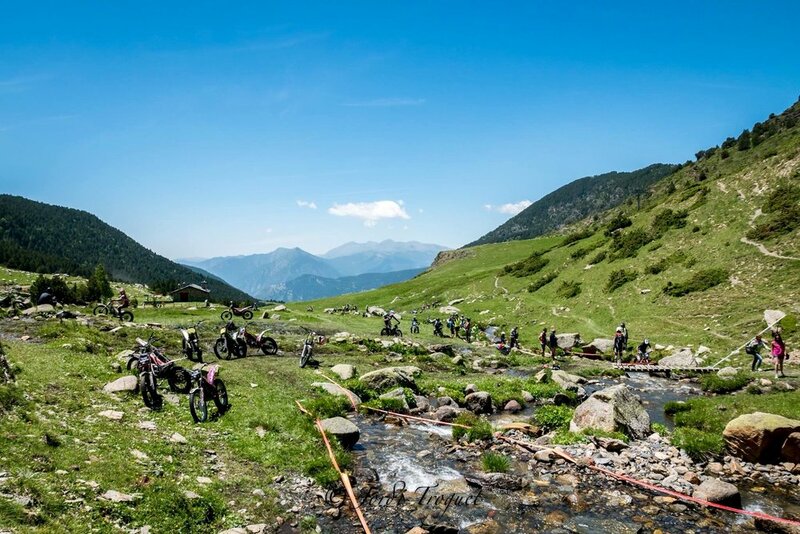 In 2015, Cyril Despres created the first Andorra500 classic in his adoptive country, with 150 motorcycles going on a three-day on-road rally. You can find several museums in Andorra, in particular the World Champions by 99, opened by five-time FIM World Champion Jorge Lorenzo, which exhibits some very rare and precious items belonging to Michael Doohan, Marc Marquez or even Valentino Rossi. You can also find plenty of shops selling gear, motorbikes, goodies and much more. Andorra is a motorcycle nation, no doubt about that! WIN 2 VIP PASSES FOR THE FIM AWARDS 2017! The FIM offers you a unique opportunity to win 2 Exclusive VIP guest passes and meet the 2017 FIM World Champions during this year’s FIM Awards*. Winners will be announced on 6 November! Over half of the Champions are now announced! With less than two months to go, the FIM Awards 2017 Champions’ list is unscrolling a little more each day. Whilst several events are still on the go until early November, close to three quarters of the names are now known. With only weeks left, who will be the next name to feature on the FIM Awards Champions’ list? Quintanilla retains his world title in Morocco. 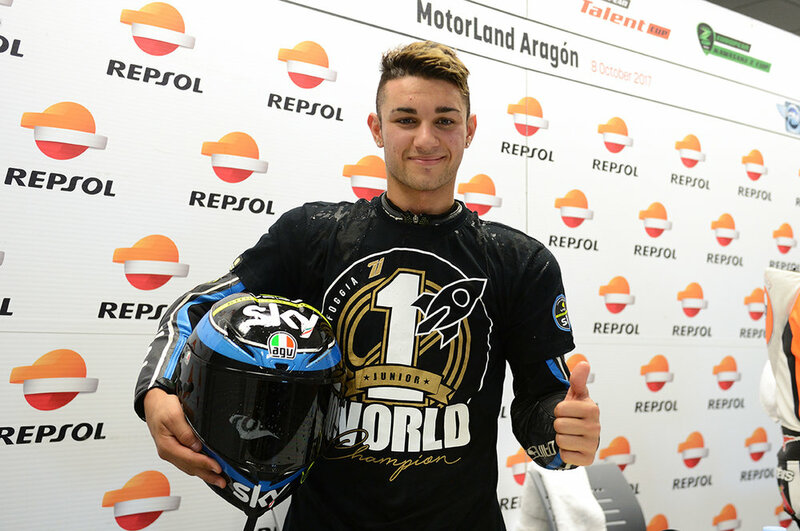 Freshly announced champions are young Italian Dennis Foggia in the Moto3 Junior World Championship and World Champion Pablo Quintanilla in Cross-Country Rallies. The rider from Chile is thrilled to be back at our sports entertainment ceremony this year. The 2017 FIM Awards will have the honour of rewarding defending champions Toni Bou – for his 11th titles in X-Trial and TrialGP, Jonathan Rea (Superbike), Ryan Dungey (Supercross), Emma Bristow (Trial), Thomas Chareyre (S1GP SuperMoto) and Colton Haaker (SuperEnduro). Several new faces will shine on the Awards stage this year including Italian motocross trio Antonio Cairoli (MXGP), Kiara Fontanesi (WMX) and Gianluca Facchetti (125cc Junior). The FIM unveils the FIM Awards! The Fédération Internationale de Motocyclisme (FIM) is proud to announce the new identity of its end-of-the-year flagship event. The FIM Awards are about to become one the most renown Prize-giving ceremony in the world of sport. Sport, suspense and glamour will be the watchwords of this breath-taking evening show! A glittering cast of no fewer than 40 world champions will gather onstage alongside high-profile guests to celebrate the end of this motorcycling season with a Grand Finale. On Sunday 26 November, Europe’s highest capital Andorra-la-Vella will play host to the great motorcycling family in a spirit of festivity and harmony. The FIM’s annual prize-giving ceremony is officially becoming the FIM Awards. To grow its audience reach, this premium event now has a new, modern and elegant logo perfectly reflecting the Federation’s values: passion, excellence, engagement and courage! This identity-affirming get-together will mark the crowning moment for the year’s motorcycling heroes while showcasing the range and depth of the FIM’s activities. Be the next FIM Gala Host! The Fédération Internationale de Motocyclisme is officially launching its Invitation to Tender for the Hosting of the 2019 and 2020 FIM General Assemblies and Gala Ceremonies. The FIM is the world governing body for motorcycle sport and the global advocate for Motorcycling. The FIM Gala is the sporting season prize-giving ceremony. The most glamorous event of the motorcycling world is broadcast on TV and digital platforms. The FIM World Champions, Legends and Award Winners walk on stage to receive their medals in front of a prestigious gathering of FIM stakeholders; such as promoters, sponsors, influencers, associations; and international media. The FIM Gala Ceremony is a unique opportunity for a city to host a star-studded event showcasing some 50 world champions and to associate itself with an exciting and high-profile sport. The FIM General Assembly takes place one day before the FIM Gala Ceremony and brings together delegates representing more than a hundred National Federations on all continents around the world.